Fremont, CA – The Advanced Research Products Group (ARPG) of Spectral Dynamics, Inc., today announced booking the first order for their new KRONOS-V System to General Motors. The facility is Powertrain & Advanced Engineering Group located in Wixom, Michigan. 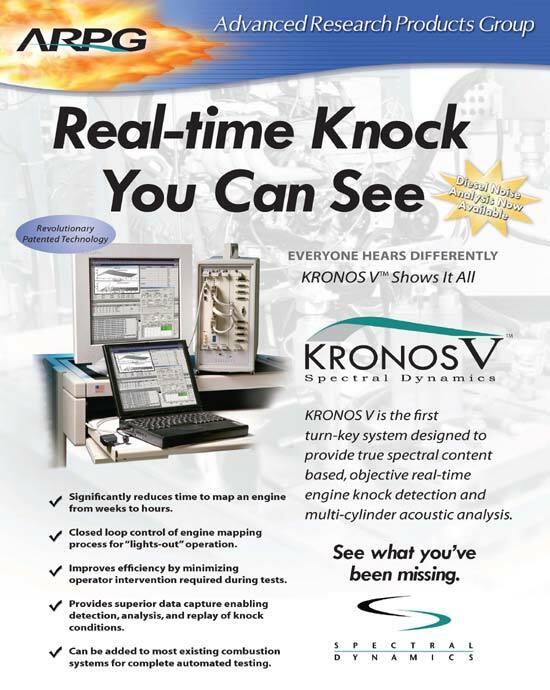 KRONOS-V is a dedicated turn-key system for true spectral KRONOS Vcontent-based, objective real-time engine knock analysis. 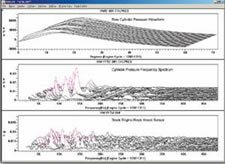 The KRONOS-V Knock Analysis tool is an add-on for most combustion analysis and charge amp-based systems. It offers a range of channel counts and capabilities including: Engine Knock and Pre-Ignition, Closed-Loop Lights-Out Engine Mapping, Diesel Noise, and Transfer Function Analysis for Star ModalTM. 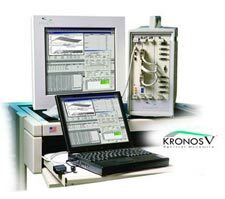 KRONOS-V is an Automated Knock Detection/Calibrator Feedback System for multi-cylinder measurement & recording. 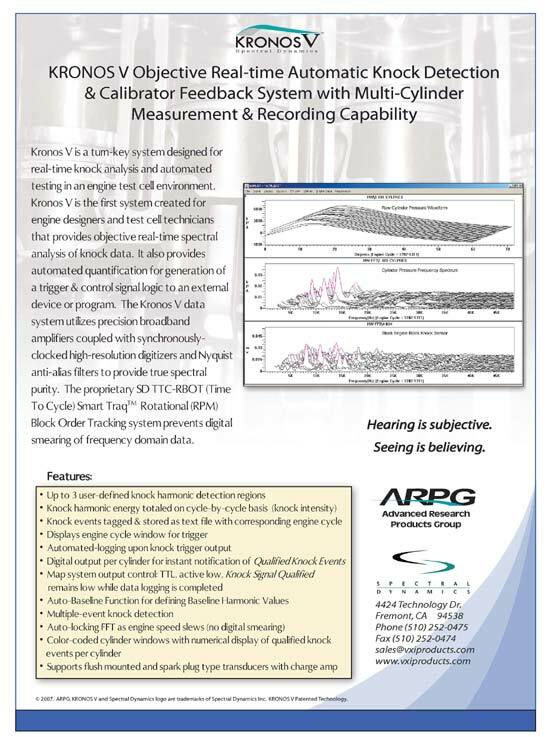 KRONOS-V allows real-time spectral analysis of multiple knock events contained in cylinder pressure data or block mounted acoustic transducer data, with automated quantification of the signal contents for generation of triggers to external devices or programs. The data system uses broadband amplifiers and synchronously clocked high-resolution digitizers with auto tracking Nyquist anti-alias filters to provide spectral purity and prevent digital smearing of critical frequency domain data.